November 8th in Wordpress Plugins by Wordpress Jedi . All experienced WordPress webmasters understand the importance of cleaning up and optimizing their database from time to time to keep it from becoming unnecessarily bloated. 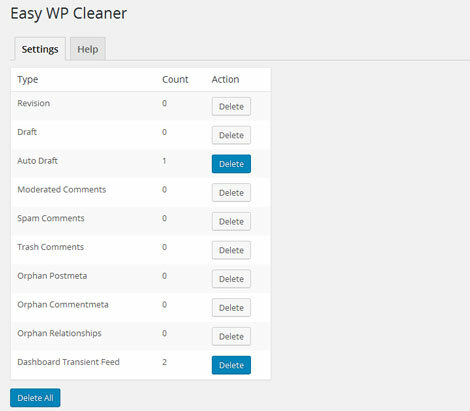 With Easy WP Cleaner, you will have an easier time removing unnecessary entries from your database. This plugin removes revisions, draft, moderated comments, and other similar entries from your database. Easy WP Cleaner lets you choose which items you would like to remove from your database. It lets you optimize your WP database without having to load phpMyAdmin. Once you have installed the plugin, go to the Settings page and delete what you like. Easy WP Cleaner makes your database a bit smaller without affecting your visitors’ experience. This is a free plugin.